Rally House Detroit in Livonia, Michigan, west of downtown Detroit, is near Redford Charter Township. Go south of I-96 on Middlebelt Rd. 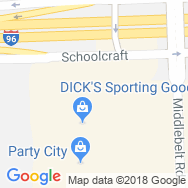 Find us on the immediate right, on the west side of Middlebelt Rd. We are your Red Wings store near downtown Detroit. We are your Detroit Tigers team store. We are Rally House Livonia representing Detroit and all of Michigan with Red Wings apparel and Detroit Tigers gear. 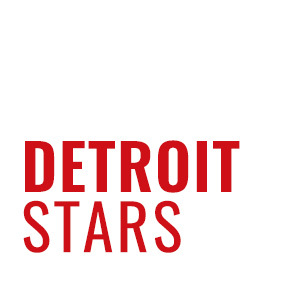 We are here to take you pro with Detroit Pistons, Detroit Lions and even Detroit Stars sports apparel. Stop in to stay in the game and Show Your Colors! Spring into Rally House Livonia to find the finest NCAA gameday gear and apparel. Whether you prefer to "Go Green" with Michigan State or "Go Blue" for the Michigan Wolverines, you'll find the largest collection of collegiate team merchandise at Rally House Livonia. We know you love the Detroit metro as much as we do. The late nights at Comerica Park, the chilly Sundays at Ford Field, and the action-packed matches at Little Caesars Arena fuel this city every day. Whether you are cheering for your city or travelling across the country, Rally House has Detroit apparel perfect for your style and great Michigan souvenirs to commemorate your trip. Shop our local collections to represent Motor City and Michigan with Detroit apparel, Michigan souvenirs, and even USA gear. Regardless of which city or area you love to represent, we can all show our RALLY! Visit Rally House Livonia to shop the most diverse selection of apparel, home decor, and gifts for your favorite Michigan teams. Shop Tigers jerseys, Lions sweatshirts, Pistons tees, Wolverines tailgating gear, and so much more. Find the best brands and popular styles at Rally House Livonia, including Nike, Adidas, Majestic, New Era, Retro Brand, '47 Brand and Mitchell and Ness. Show off your fan pride and step up your gameday jersey with authentic jerseys of hometown favorites like Barry Sanders and Matthew Stafford. Rally House Livonia store associates are here to provide exceptional customer service, whether it's chatting about the upcoming rivalry game or helping you find a gift for a relative. When visiting one of the most influential cities in America, you have to bring a Detroit souvenir back home. Stock up on Detroit souvenirs to check off everybody on your list. Whether you are looking for Michigan keepsakes for yourself or your family, Rally House Livonia is your Detroit gift store and souvenir shop. Follow us on Facebook, Twitter, and Instagram to stay up-to-date on all promotions, coupons, and giveaways!